We provide sworn translation services for the following documents such as: Immigration certificates, Other immigration-related documents, Birth certificates, Marriage certificates, Visas, Divorce certificates, Translation Diplomas, etc. The translation rates are calculated on the basis of the number of resulting words or pages after translation. The translation result to be received by the client is in hard copy in the form of print out on a piece of A4 80 gr paper. Each translation project will be charged a Down Payment amounting to 50% of the estimated translation result or PO (Purchase Order). The full payment of the translation services will be made only upon complete and proper receipt of the translation result by the client. 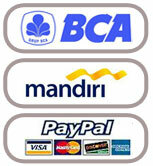 All payments may be made by way of bank transfer to any of the following banks: BCA, Bank Mandiri, BNI, BRI or HSBC. Document pick-up will be charged on a proximity basis. The price list as listed above is exclusive of taxes and may be subject to changes at any time.